Australians are sick of your government's excessive and irresponsible immigration rate and 457 Visa intake levels. This is clear by studying recent polls, Mark O'Connor's book Overloading Australia, and monitoring social media. Of particular concern is the dreadful impact that the your resulting unsustainable and damaging population growth rate is having on our local urban and natural environments. The New Zealand Defence Force early in Janurary surprised a third unlicensed fishing boat, far south-east of Tasmania, illegally poaching toothfish - the ocean's "white gold". The New Zealand government so far has intercepted three ships with their offshore patrol ship, HMNZS Wellington, in cooperation with the Sea Shepherd Conservation Society. This summer is Sea Shepherd’s 11th Southern Ocean Defence Campaign and the first to target toothfish fishing operators in the waters of Antarctica. 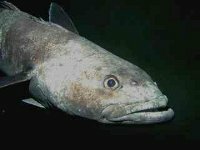 Patagonian toothfish, a species of cod icefish, can grow up to 10 kilograms in weight and are a highly prized eating fish.